I don't know how to describe these cookies except for heavenly! 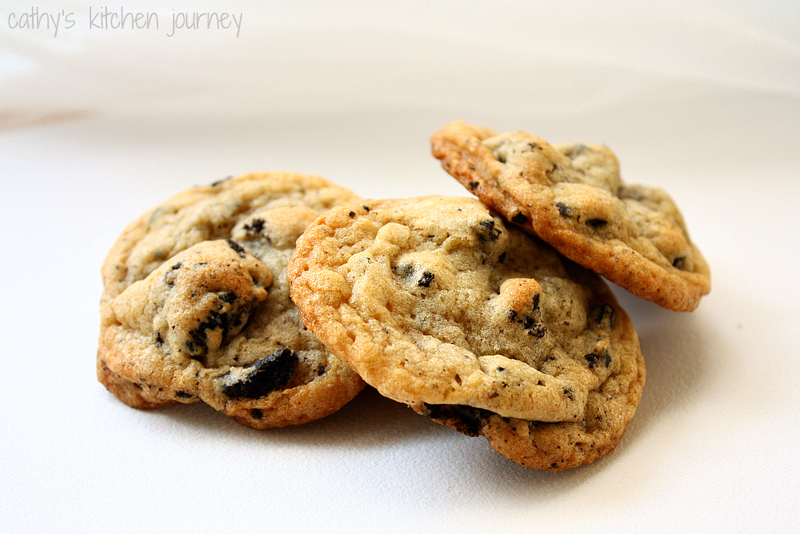 They're rich and buttery, and I love that they have my favorite cookies baked right into them! I had a huge box of Oreos in my pantry because my sister helped me get them from Costco. I use some for the base of the red velvet cheesecake per my brother's birthday request, and still had a ton left over. Of course, since I love Oreos, I would have no problem eating the whole box..but it would take a while since I only eat one or 2 a day. I pinned these cookies a while ago and I'm glad I made them! They're so easy to make and they taste great. It really is hard to describe! I had to stop myself from eating the whole batch! Luckily I was bringing them to a housewarming party, and they went like hotcakes! I made these dairy free by swapping out the butter for Earth Balance Sticks. They still came out great! I also accidentally added 1 tsp of baking soda instead of the 1/2 it called for, but luckily it didn't make a big difference since there were enough cookies in the dough to keep it from totally flattening out. In the end, these still tasted like perfection. Try these, you won't regret it! Fold in Oreo pieces with a spatula. Using a small cookie scoop, drop cookies onto a greased cookie sheet or a sheet lined with parchment paper. Bake in preheated oven for 8-10 minutes on the top rack until edges start to turn golden brown. Remove from oven and let cool on the sheet on a rack for a few minutes before transferring to the rack to cool completely. These are cookies within cookies ;) Something I would love to try anytime. I am sure my little girl will enjoy snacking on these.